Our new build house has been standing without siding for two years. I am about to replace the weathered tar paper with two new layers of 15# felt before siding the house with cedar clapboards. The house will have a ½” rain screen gap made of strips of PT plywood. The walls are intended to dry to the outside. We’re in the coastal rainforest of Southeast Alaska – very wet. Traditional wooden sliders windows will be installed. The rough openings will be flashed with rubberized flashing and a solid sill pan (www.jamsill.com). My plan is to apply two layers. The first layer will be held with a minimal amount of stainless steel staples, followed by another layer held with “Stinger” plastic-cap staples, followed by the furring strips for the rain screen. This will be done in quick succession, one wall at a time, so there’s no time for the felt to sag, blow away, or tear from the staples before the furring strips go on. Corners (should I avoid wrapping the corners with both layers? This would create four layers at the corner, which seems like it would impede drying through the walls). How much should corners be lapped? What about inside corners? Anything else that requires close attention? Best practices regarding blown-in insulation in a double-stud wall? Add exterior foam -- but paper-faced batts? The reason that you find very few resources on how to install asphalt felt as a WRB on walls is simple: manufacturers of asphalt felt don't support the use of this product on walls. It is intended to be used only on roofs, so the manufacturers will never tell you how to install it on walls. Yet all building codes require builders to install a layer of #15 asphalt felt on the exterior side of wall sheathing. All other WRB products are just "approved substitutes" for the real thing -- asphalt felt. The code says you've got to do it. The manufacturers say you can't. What to do? What you do is to apply common sense. 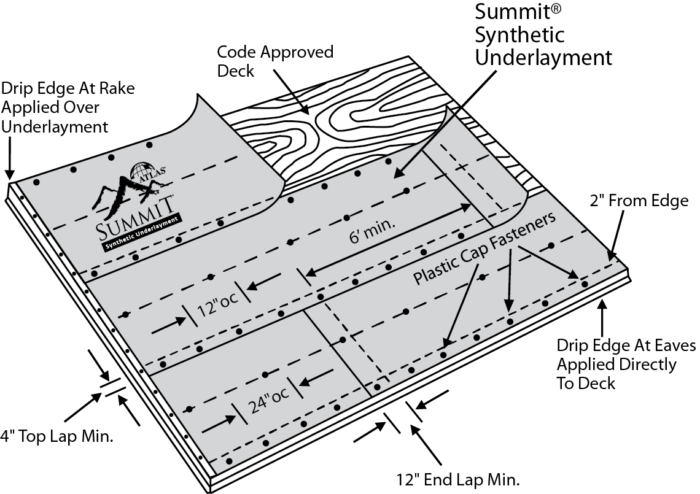 A roofing underlayment guideline (see image below) shows a 4 inch lap of one course over the course below, and a 12 inch lap when you need a lap from right to left (an end lap). That sounds about right. Fold the felt in the corners carefully so it doesn't rip. Two or three layers of felt in the inside corners makes more sense than four layers to me.